• Ready, Set... Boost! 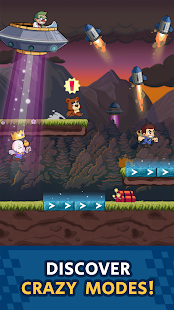 Choose your favourite Halfbrick character and compete against other players from all over the world. 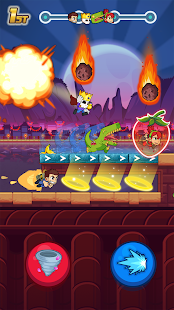 Booster Raiders is the newest game from the Makers of Fruit Ninja, Jetpack Joyride and Dan the Man. 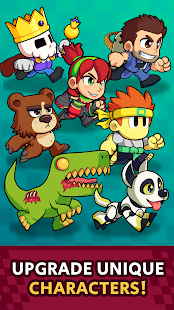 • Gather your friends, choose your character, track your progress upgrading it, jump, boost, shoot your items and get ready for the most epic multiplayer race throughout colorful environments! These are the Halfbrick all-stars available characters. • Barry Steakfries from Jetpack Joyride. Though he doesn’t get tired of running through the halls of Legitimate Research, he wanted to challenge his Halfbrick mates. This crazy guy will make the other runners bite the dust by taking the jetpack with him. Throwing rockets, shooting the shot gun, placing dynamite cartridges or using a protection shield are some of the items he will have for defeating his competitors. • Mari from Fruit Ninja. "Life's too short to be bored for the bright", Energetic Mari enjoys playing tricks on her friends even more than on her rivals. 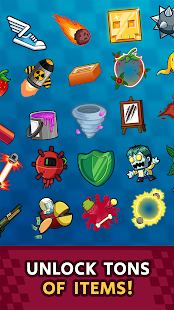 You will be able to throw a strawberry burst, leave a banana skin, use her yoyo swirl or even force your opponents delay with the hurricane item. • Rory the Bear from Bears vs Art. This stunned character is the last of the common challengers, but how could you have fun with this crazy bear? Throw a statue, leave an easel, stop your competitors with a color splash or paralyze them with paint buckets over their heads. • The King from Raskulls. So now you've collected the previous characters and you want to move forward, don't you? Let us introduce you The King. Speed is his last name. This wacky rare character will attack the other raiders throwing a brick, blocking their path dropping a golden block, protecting himself with a magic shield or freezing them with the Raskulls shock. • Flash the Cyberdog. Barry's best friend but from now on his main rival! Flash goes like a bat out of hell and will use all Legitimate Research gadgets to be number 1. Woof! • Dan from Dan The Man. One of the most popular arcade Halfbrick stars. He needs to go beyond his own game and battle with others in a race. Select this mad character if you want to defeat the others throwing a shuriken blast or block their path dropping a floating mine. If any of the other racers attacks him he'll be protected by a dragon of fire. Finally, this challenger will use some resistance ninjas to force the other runners stop for a while. • Zombie T-Rex from Age of Zombies. This screwy dinosaur is the Lord of the races. This epic character will delight the veteran players. His dino breath will freeze the other stars. In case any other is chasing you, you can drop a zombie minion to make the other think twice. Also, defeat other runners by a gib explosion or use his meteorite rain. • Fruitasia from Fruit Ninja. • Laboratory from Jetpack Joyride. • Race: The easiest game mode. From start to finish. An insane competition where everything matters. • Lap Race: Be the first one after 3 laps. The batlle is longer here and it doesn't really matter if you are the last during the first 2 laps. What it counts is to cross the finish line the first in the final lap. • UFO: Dr. Brains from Age of Zombies has become and is rampaging through the city. Allied with the aliens, he wants to lobotomize our all-stars team piloting an UFO. 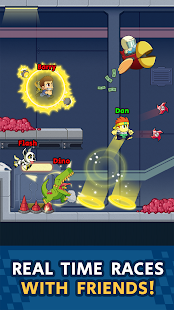 In this elimination mode you will have to avoid the UFO ray, so be sure you are not the last one. Finally, don't forget to invite your friends throughtout several channels and challenge them in your available events!